Tonight I was walking downtown along Stephen Avenue Mall in front of the Art Gallery of Calgary quite late. It was fortuitous timing as three artists (Caitlind r.c. 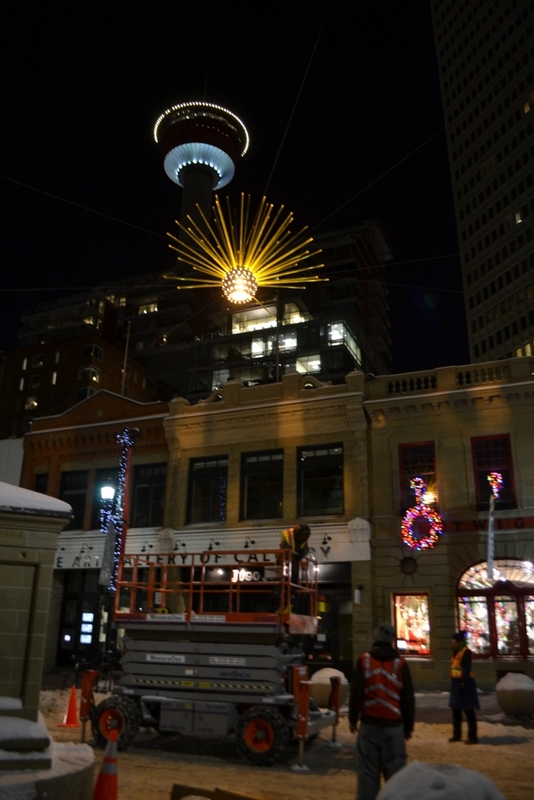 Brown, Lane Shordee and Ivan Ostapenko) were in the midst of installing the new Solar Flare light installation, which was commissioned by the Calgary Downtown BRZ. Moments after I arrived, they wheeled away the lift. Fortunately, I was able to get in a few pictures of the installation when the new installation was not fully installed and before they moved the lift to park it one of which I used above. The Roots The roots of this solar-powered installation were formed during the first Calgary Nuit Blanche which occurred during Calgary 2012 and was originally proposed as an annual event. Now it appears to be a biannual event as it did not happen this past year and was replaced the newly formed Intersite Visual Arts Festival that occurred on the same weekend as Nuit Blanche should have happened. All this contains some speculation on my part, so here goes. No doubt this happened (in part) so that public institutions which must plan their programming far in advance could fulfill their obligations to the contracted artists during what they previously expected would be the weekend of Nuit Blanche . But I digress. During the 2012 Nuit Blanche event one of the most interesting events was an installation that contained both burnt-out and live incandescent light bulbs. These bulbs were all connected to hanging pulls that turned the lights on and off. It was in the form of a large cloud and it magical. People loved it and it became an internet sensation – and rightfully so. From my recollection when I attended the night of Nuit Blanche, it could best be described as enchanting. The images spread quickly. In fact, months later there was a show at an art gallery in Moscow of a new version of this cloud that no doubt came partly as a result of images that were picked up off the internet. This new work was constructed in Russia. A number of months later a smaller commission was completed at what I believe is a gay bar or club in Chicago. As was the case in Russia and Calgary, this newly formed cloud (truth be told – clouds, as there were more than one cloud installed in this club) also met with success. Phantom Wing Fast forward to the recent Phantom Wing project at cSPACE King Edward School. The artists involved with the Nuit Blanche Cloud also formed the Phantom Wing signage for that event as well. The signage subsequently also was modified somewhat and used for the Phantom Wing website. Once the Phantom Wing project had barely wrapped up, they were off to recover the Russian cloud and then re-install it in the heart of Prague, Czech Republic alongside the Vlatava river. This was for an event similar to Nuit Blanche and probably was as captivating as it was at each other location it has been shown at. Sometimes the history behind something is important. This is one of those cases. It is very interesting seeing where this light installation by Caitlind r.c. Brown and Wayne Garrett came from as it might otherwise be easily missed due to the location and the temporary nature of its installation during the next few months. Events There also will be an artist talk with Caitlind r.c. Brown and Wayne Garrett which will take place at the Art Gallery of Calgary on Thursday, December 19, 2013 at 6:00pm. Smart move on the part of the Calgary Downtown BRZ on commissioning this work. If you are downtown at some point between now and early February check it out. This entry was posted in Art Gallery of Calgary, Calgary 2012, cSPACE, Intersite Visual Arts Festival, Nuit Blanche, Phantom Wing, Solar Flare, Wreck City and tagged Caitlind r.c. Brown, Calgary, Chicago, Installation art, light art, Moscow, Nuit Blanche, Prague, Solar Flare, Stephen Avenue, Visual arts, Wayne Garrett.